Industrial and institutional (I&I) cleaners are defined as those cleaners intended for routine cleaning of offices, institutions, warehouses, and industrial facilities. In both developing and developed regions, market growth will continue to be driven by factors such as increasing safety and environmental regulations and growing public awareness of health and hygiene. Health concerns about recent outbreaks will help increase use in janitorial/sanitation applications. Other factors affecting the development of the I&I market include travel (business and leisure), infrastructure and construction (commercial), government spending, automotive production, and industrial production. Demand for green solutions continues to expand. The I&I market is highly diversified across geographic regions, products and services, end-use markets, and customers. The broad end-use market diversification of the I&I industry, the consumable and recurring nature of the products and services, and the governmental and regulatory requirements for hygiene and cleanliness have been the basis for stable growth trends for this industry over time. 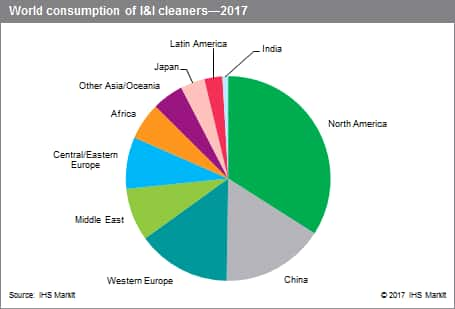 Janitorial products constitute the largest segment of the total I&I market (about 29% of the total market), followed by kitchen and catering (20%), based on the market segmentation for North America, Western Europe, Japan, and China. The share of the individual market segments, however, varies considerably within the regions discussed. Janitorial is largest in North America. Kitchen and catering are the largest market segments in Western Europe and Japan. In China, the technical/industrial sector is largest. North America owns more vehicles (especially cars, carriers, and airplanes) per capita than other regions, so the vehicle wash segment in that region is also much larger than in others. In contrast, the laundry detergents market segment accounts for a larger share in Western Europe (9%) and China (8%) than in North America (7%) or Japan (6%), as Europeans more often live in apartments and use commercial laundries, and China has a large textile industry and a significant market for washing of workplace uniforms. North Americans more often own homes and use their own laundry facilities. Consumers of I&I cleaners are diverse manufacturing units, food and beverage processing plants (meat and poultry hygiene), the automotive and transportation industry, cleaning companies and building service contractors, restaurants and hospitality industries, provincial authorities, retail (supermarkets), hospitals, municipalities, and other commercial facilities. Effective, eco-friendly, and less-labor-intensive products are in demand. A significant portion of buyers in the I&I cleaners industry are multinational businesses, such as major hotels and international restaurants. There are numerous active participants in the market, some with a global presence, while others are regional players. Because of the attractiveness of the business, several large companies from different backgrounds have entered the I&I cleaners market in the past. Significant examples include Procter & Gamble Company (mainly a consumer products company in the areas of pharmaceuticals, detergents, and personal care), The Clorox Company (has expanded into the institutional sector from its base in consumer products), and Kimberly-Clark Corporation (expanded into I&I cleaners from paper accessories into personal care and washroom products; however, remains predominantly a supplier of cleaning wipers and towels). There is a growing industry interest in eco-friendly and sustainable products. Bio-based products are appreciated, and new products continue to be introduced. An example is Ecolab’s line of bio-based hard-surface cleaners. Product innovation and differentiation through chemistry is limited, but more applications-specific products are offered to fulfill the specifications required by different end users. Also, there are changes and innovations in packaging, dispensing equipment (precision dosing, moving away from sprays), and devices (labor-saving) used along with cleaning agents. Overall, the I&I cleaners market is projected to grow at an average annual rate of 3.5% during 2017–22. Industrial and institutional cleaning products represent a mature market, especially in Europe and Japan. The report presents more detailed market information for four major world areas (North America, Western Europe, Japan, and China) on the basis of products for six broad product/market classes (janitorial products, kitchen and catering, transportation, dairy/food processing cleaners, laundry products, and technical/industrial). Consumption within these product categories is further broken down, in most cases by customer type (e.g., restaurants, nursing homes).